No two ways about this: tabs are of great help in operating many programs. Unfortunately, the fi le manager is not equipped with them. Just like browsers, tabs simplify work even in the Windows Explorer. 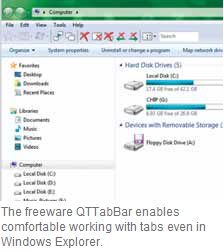 The English freeware QTTabBar starts the fi le manager with the handy tabs. You can obtain the file from here qttabbar.wikidot. com/download. INSTALLING THE TOOL: Open the EXE file, follow the instructions and restart the computer for installation. The .NETFramework 2.0 must be installed in case of Windows XP; and this is usually the case. First of all activate the Windows Explorer toolbar. Open ‘View | Toolbars’ in XP for this and activate both bars: ‘QT TabBar’ as well as ‘QT Tab Standard Buttons’. In case of Vista and Windows 7, you first need to make this visible using ‘Organise | Layout | Menu bar’. USING THE TABS: The tabs are controlled using the icons of the second bar on it. You can open a new tab with a click on ‘Clone this’. A folder can be opened in a new tab by clicking with the middle mouse key and can also be dragged in the tab browser using drag and drop. There are various icons with different functions for closing tabs. The access to accidentally closed tabs using the ‘Recently closed’ icon proves to be helpful. CUSTOMIZING THE TOOL: The appearance and functions of QTTabBar can be configured in numerous ways. Right-click on a free spot in the tab bar and select the ‘Options’ context command for opening the settings. For instance, activate the ‘Show close button on tabs’ option in the tab to display a button for closing in every tab. The option of integrating access to certain applications in the toolbar is of great help. You can use this to comfortably open the marked file in an Editor for instance. Switch to the ‘Applications’ tab for this and click on the plus icon to the right. Then, click below on the search icon next to the ‘Path’ field. Navigate to the program file ‘notepad.exe’ in the ‘C:\Windows\System32’ folder or to any other Editor and ‘Open’ it. Click on the icon next to the ‘Arguments’ input field and select the command ‘%f%selected file’. You can link yet another direct key combination using ‘Shortcut keys’. You must subsequently confirm all settings one after the other using ‘Apply’ and ‘OK’. In the future, you can call the Editor from the toolbar under ‘Applications’.